We've already seen a first look at Halle Berry suited back up as Storm in X-Men: Days of Future Past, but director Bryan Singer keeps giving us some tidbits of scenes being shot on the set of the prequel sequel. 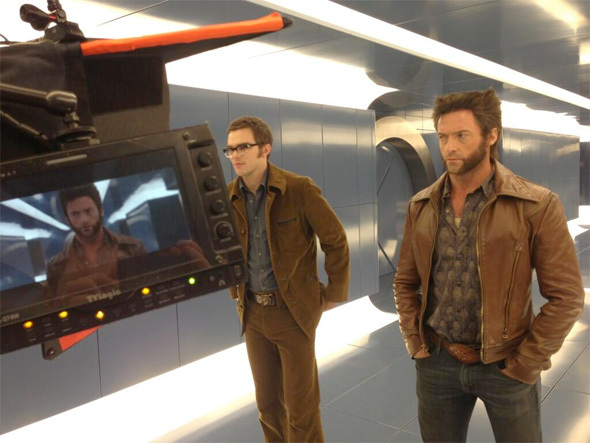 This time Singer has delivered a behind the scenes look at Wolverine (Hugh Jackman) and Beast (Nicholas Hoult) in their 1973 wardrobe in the underground hallways of Charles Xavier's School for the Gifted. They should look familiar to fans of the original X-Men trilogy. Personally, I'm wondering why Beast isn't in his blue furry form. Has he figured out how to keep that anomaly he created in the first film at bay? Wow, Hugh Jackman just jumped right into this right after THE WOLVERINE. he doesn't have to change wardrobe. Kinda what DAVIDPD said, with Jackman making his appearance after "the wolverine". I'm curious if this sequal to XMEN: FC, will....continue?...after XMEN 3 with older Charles Xavier dead and Magneto having lost his powers (or has he?) or if its gonna take place before XM3 or how it's all gonna work? Basically is it gonna be a new story or a continuation of some sort. It's been confirmed that The Wolverine takes place after The Last Stand, and that this takes place after that. This is both X-Men 4 and First Class 2...featuring cast members from the trilogy and from FC. Of course it features time-travel and things like that too, so it doesn't exclusively take place as a sequel. It will have events that occur after all of the other films, and events that are more of a direct followup to First Class. It'll certainly be interesting to see exactly how it all plays out..alternate realities and things of that nature might very well be at play...thus sort of 'explaining' some of the continuity mistakes across the trilogy and the two prequels. In the version of last stand I saw Xavier woke up at a hospital we hear his voice talking to a nurse? during after credits? The story is after X3 and the wolverine and also after first class. (Shivers) "so exciting!" From Blade II. "Fan Bingbing and Boo Boo Stewart." You just made those up... right? Fan BingBingBing is also in Iron Man 3, Chinese version. Ash Williams would say - "Groovy"
Billy Madison would say, "that's quacktastic!" This painfully feels like a Bryan Singer X-Men film. This needs to go back to Marvel already. BTW Jack The Giant Slayer was garbage. So was Superman Returns. Thanks for nothing, Bryan Singer. Where's the real X-Men costumes??? They aren't out in the the middle of some battle in this pic, why would they be in costume?? I hope Jackman never has to wear a yellow jumpsuit with horns on it, unless the do it and i really like it... then who cares! Can you spare us the agony and scrap this film? If you haven't learn by now that Bryan Singer and X-Men dont mix there is no hope for Marvel. What are you talking about? X-men 2 is to this day one of the best none Marvel produced films and he also help bring First Class to life with Matthew Vaughn. He had nothing to do with X-3. BUT DOES WOLVERINE MEET SLIGHTLY OLDER WOLVERINE?!?!? !